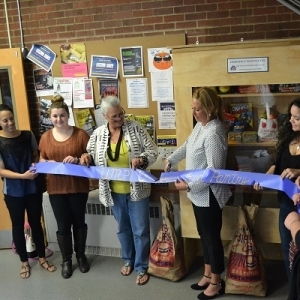 Due to the hard work of several students and their faculty, the University of Maine at Presque Isle’s first mini food pantry has been established to help combat hunger and food insecurity. 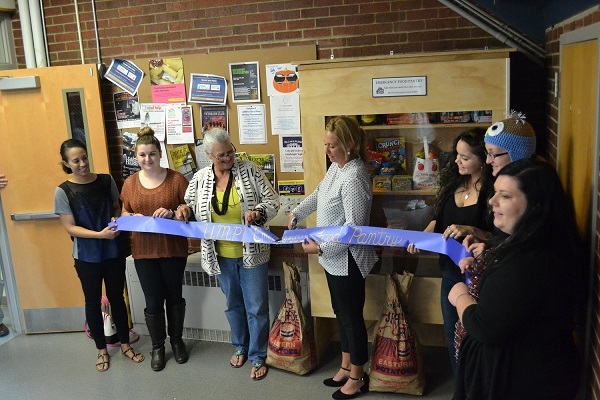 Earlier this fall, the Student Organization of Social Workers-Food Security Council held a ribbon cutting ceremony for the newly-established Emergency Mini Food Pantry on the ground floor of Folsom Hall. The food pantry was set up to help students in need or who might not have access to food at any given time. It has taken three years to get the food pantry up and running, and those involved in the process are grateful to see their work become a reality. “A project like this starts with a spark from a little voice of concern, and it is sustained by the passion of others who want to see change happen,” Desiree Ellis, one of the UMPI students who helped to establish the pantry, said. Shirley Rush, Associate Professor of Social Work and BSW Program Coordinator, has been with this project since its inception. She decided to take on this work because of her efforts to bring students to the Maine Hunger Dialogue. Every year, Rush takes students to this statewide event and it was there that students came up with the idea to have a food pantry at the University. In 2014, Rush taught a class on Hunger in Maine, and then students decided to create a needs assessment survey on campus. The emergency food pantry on campus is not meant to put an end to poverty, but to provide support to those who need assistance: “A mini food pantry is a response to data that confirm the reality for many students, and perhaps others, on campus. It is not a solution to poverty,” Rush said. Students at UMPI have attended the Maine Hunger Dialogue for the past three years. As part of this experience, they have applied and received mini-grants during two of these grant years. Every year, each campus has an opportunity to develop a grant for the needs of the students at their campus with regards to food insecurity and garden projects. The emergency food pantry was funded by their second MHD grant, which they share with the campus composting project. Rush said she is grateful that the emergency food pantry is here to help students.